If you’ve ever burned the bottom of a pot or pan while searing meat or after getting distracted by your phone, don’t worry: There’s a simple way to eliminate those dark marks. Carolyn Forte, director of the Good Housekeeping Institute Cleaning Lab, says she uses her mother’s tried-and-true cleaning trick, which involves water, dishwashing liquid, and that’s pretty much it! Fill your pot with hot water and a few squirts of dishwashing liquid. Then put your pot filled with soapy water on the stove and bring it to a simmer. Let the pot simmer for 15 minutes or more (depending on how much food is stuck on the bottom) and use a spatula to carefully loosen and coax the burnt-on bits off the bottom and sides as they soften. When all of the bits have been removed from the surface of the pot, empty it and scrub it clean with a pad. 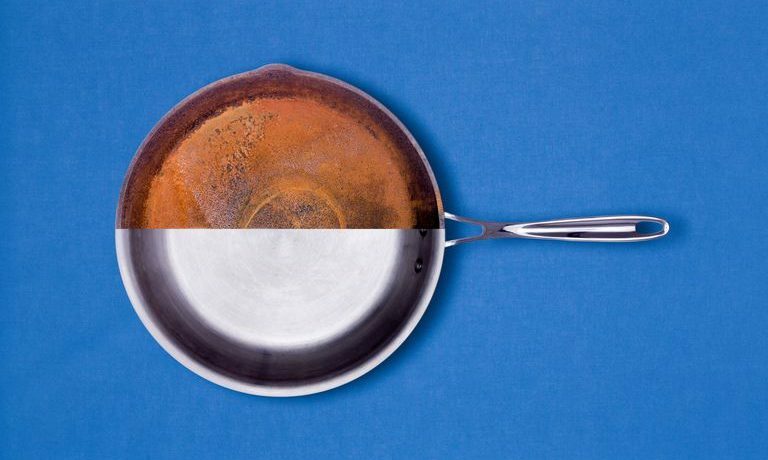 If it’s a stainless steel pot or pan, use a stainless steel cleaner to restore shine. “Keep in mind that some discoloration may remain, depending on how badly the pot was burned, but it’s still safe to use,” Forte says. If you lower the heat when cooking, less burnt-on residue will be left behind and you’ll save time in the cleaning process. Win-win! When you’re using nonstick cookware, make sure you don’t heat it above 500 degrees Fahrenheit. Use a stainless steel or cast iron pan if your recipe calls for a high-heat method, like searing or browning meat.